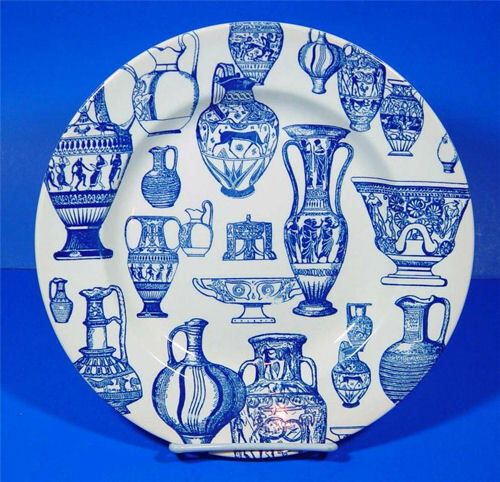 William Taylor Copeland had been in partnership with Thomas Garrett in succession to the firm of Spode (or Spode & Copeland, for the retail division) up to June 24,1847,when Garrett retired. 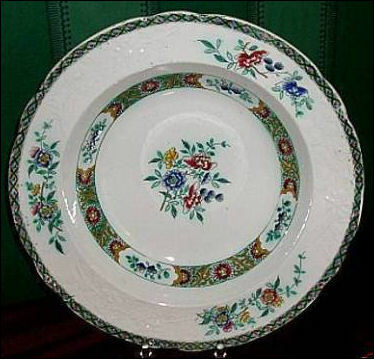 - embossed rim and floral pattern in green, red, gold and blue. Copeland, an Alderman of the City of London and Lord Mayor, continued the old Spode works in the heart of Stoke and there produced a wonderful range of fine quality and decorative porcelains and earthenwares. He was also probably the largest producer of quality Parian ware, excelling in figures, busts and groups. The Spode works under Copeland were one of the largest and best known in the country and, at the time of the 1861 Census, he employed over eight hundred workers- 359 men, 213 women and 241 children. In 1867 W.T. Copeland's four sons were admitted to the partnership and the trade style then became W.T. Copeland & Sons. However, on December 31, 1867, William Taylor Copeland retired, leaving his four sons to continue the large firm. The sons were William Fowler Mountford Copeland, Edward Copper Copeland, Alfred James Copeland and Richard Pirie Copeland. 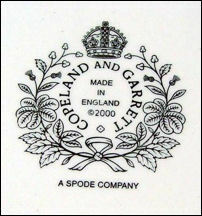 In 1970 the company reverted to the old name of 'Spode' under the style Spode Ltd.